In order to succeed it would be nice if you had Partners to assist you. 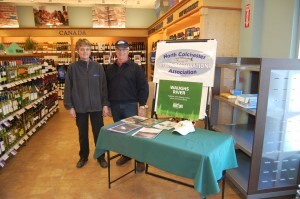 The partnership of Adopt A Stream and The Nova Scotia Liquor Commission is a great combination to be on your side. 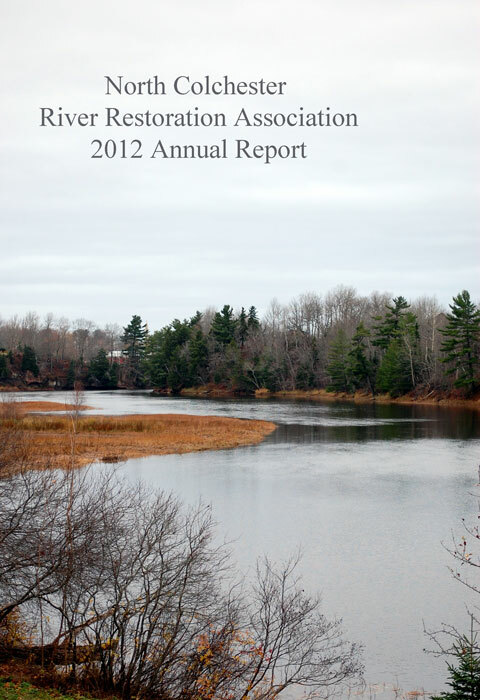 Like many other River Restoration Groups in our Province we are very grateful for the Financial support that they provide volunteer groups like ourselves. We are also greatly indebted to Adopt a Stream for the technical advice that they provide. Partnerships work and this case it works very well. The new season is one week old and the water is cool but levels are perfect for fishing. 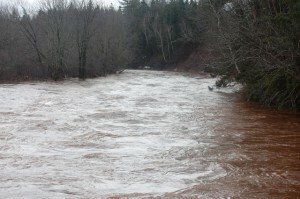 Reports from the village indicate that a few good Brown Trout have been caught. The fly fishers are finding it a challenge to entice a take but who cares we are back on the water. Palm Sunday and maybe Church Services will be cancelled due to more snow. 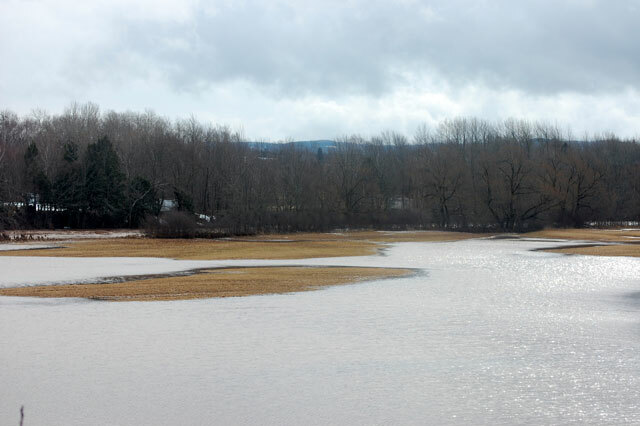 The ice leaves the river estuary only to return on the next tide. In three weeks the season will open and water levels should be fine, let’s hope so. 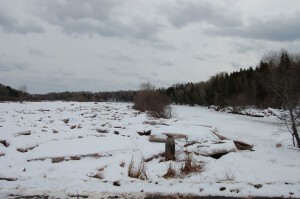 The picture attached was taken at The Lake Road Bridge on the French River. Clearly you can see the vast amount of ice that has been pushed back on to the interval between the two bridges. Prepare your gear, the fish are waiting? 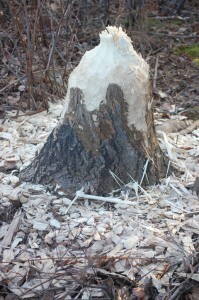 The snow is melting quicker than a spring squirrel. 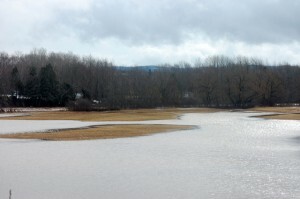 Spring like weather on Nutby Mountain has The Waugh’s River in full Spring Flood. Today the 14th of March is warm and wet and more rain could fall before dusk. Its not all bad, lots of debris is on its way to PEI and high water levels could me that lots of fish will move upstream early. One month and one day until The Season opens. Plenty of time to get your gear ready. I will report back on a weekly basis to update conditions. 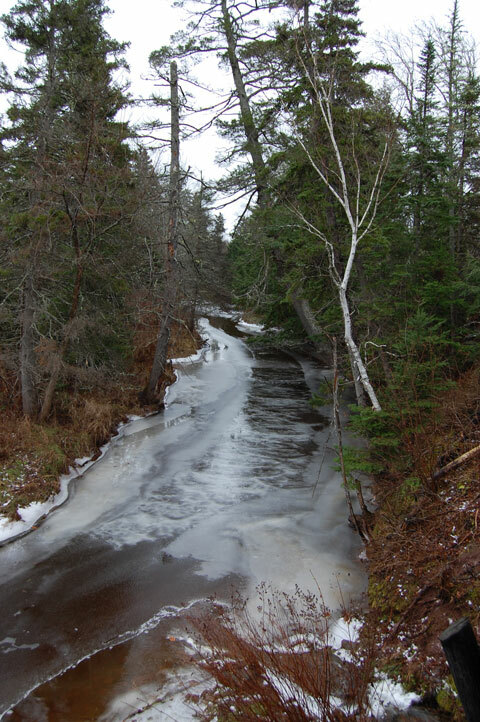 The Biz Brook has plenty of ice cover today, Monday January 14. The Biz Brook runs into The Waugh’s River just below The Murdock Bridge. 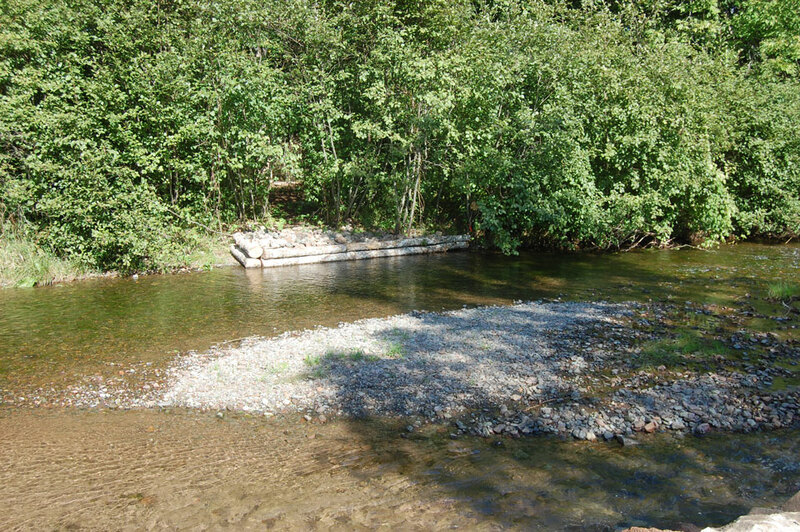 A favorite haunt of more than one beaver, the Brook is also an excellent nursery for both Trout and Sal;mon fry. 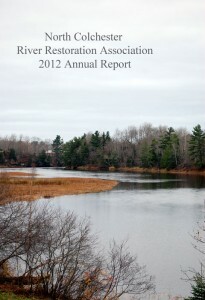 For a complete review of our Report check out our Annual Report Section at the Top of the Page. When our regular crew goes back to High School in the fall our volunteer crew kicks into high gear to clear unwanted trees near the river. We don’t pay them, they work 14 hour days , seven days a week and most importantly they don’t complain if they get wet. 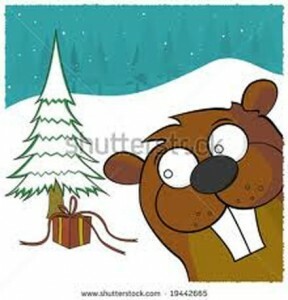 The 2012 Work season is over and plans are already in progress for next year’s work program. 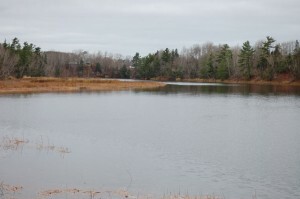 The 2012 fishing season is also over. Salmon and Brown trout were caught and released but the 2012 season was quieter compared to the 2011 season. 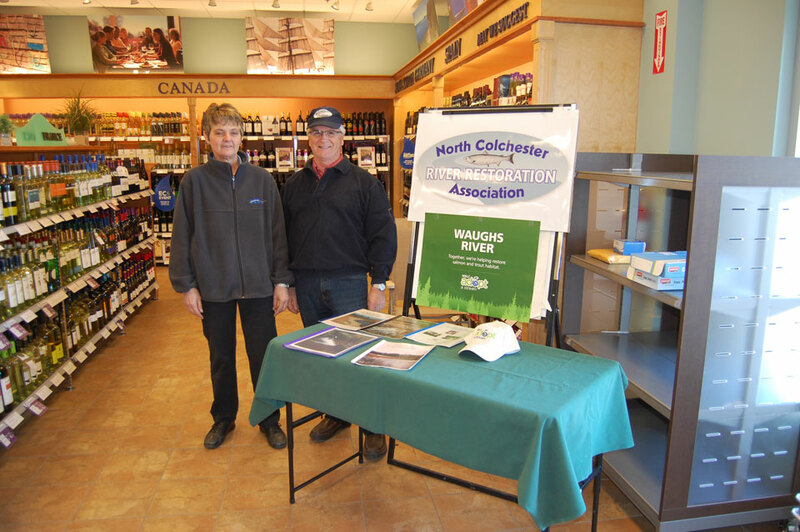 Perry Swan, Chairman of the North Colchester River Restoration Association provides Colchester North MLA Karen Casey an overview of the work that is currently underway on the Waugh’s River near the Campbell Road. Today was the first day of a one week joint project with the river restoration crew from the Millbrook First Nation. On Thursday of this week both crews will be explaining the importance of their work to the general public during this year’s Annual River Walk. 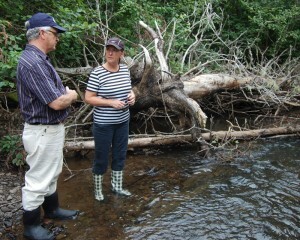 Visit the Waugh River on August 9, 1.30 to 3pm and meet two River Restoration crews working towards the same objective.